Some time around when Charlotte was born, I picked up a copy of Esme Codell’s book How to Get Your Child to Love Reading: For Ravenous and Reluctant Readers Alike thinking I would use it as a resource. You see, I was very worried my kiddo wouldn’t love books as much as I do. And, like Esme, I believe that reading is integral to every kind of succes a child might have in life–educational, social, personal, spiritual, you name it. I proceeded to devour Jim Trelease’s classic The Read-Aloud Handbook and Jennie Nash’s moving memoir Raising a Reader: A Mother’s Tale of Desperation and Delight. They eloquently write about why it is important to read to your children; what lessons we have to learn from Oprah, Harry Potter, and the Internet (Trelease); and the anguish of having a child who doesn’t click early with books (Nash). I gobbled up the lessons, prepared to sweat it out if Charlotte was a late reader, to be patient if she didn’t read at grade level until age 8 or so. I needn’t have worried. On her second birthday, Charlotte picked up the sippy cup, looked at it and said “B,” pointing to the letter b on the Gerber cup. She quickly learned her alphabet (listen to her read it here) and by the middle of pre-school was reading 3-letter words. By the middle of kindergarden, she was reading ahead of grade level in English and her teachers surprised me with an account of her reading 3- to 5- letter words in French. I didn’t blog about it much because I didn’t want to sound like a braggart. We were, however, contiunally amazed and constantly asking her teachers how to keep her challenged. And, I posted about some of our favorite characters like Iggy Peck, Architect (follow this link to hear Charlotte read Andrea Beaty’s now-classic book) and Skippyjon Jones. I still know those books by heart because I read them all dozens of time. Famously, we read Iggy Peck, Architect every night for more than eight months. Why the trip down memory lane? Because tonight Charlotte read aloud to me, a chapter of My Father’s Dragon, a children’s classic by Ruth Stiles Gannett that I’ve never read. Her homework was to read a chapter. I asked if she’d like to read it aloud since that is what she does in her enrichment class. She jumped at the chance. I was enthralled by her expression, her fluency, and her confidence as she sounded out hard words. I have read to Charlotte every day since I was by her side at Children’s Memorial Hospital. I may have sounded crazy reading The New York Times and Fortune magazine to my infant, but read I did. Watching her learn to read was amazing. Seeing her grow into a joy of reading that led to her lying on the couch yesterday to read Ramona the Brave for an hour is awe-inspiring. 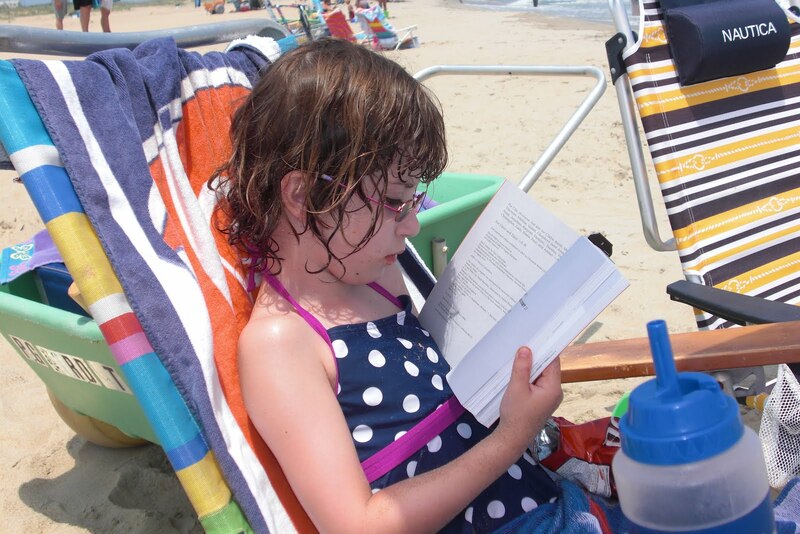 And, the first time she sat on the beach and read last summer made me hopeful for quiet, restful beach vacations! Charlotte and I (and you, dear reader) are so fortunate to be literate. To be able to read these words. Join us on March 7 as we celebrate World Read Aloud Day, bringing attention to global literacy challenges that leave 793 million functionally illiterate. I’ll be blogging here, and at Culture Bean, from now until then about read aloud adventures I’ve shared with Charlotte, my mother, and others. Feel free to chime in with your own stories–about a book that was meaningful to you, a favorite read aloud you heard as a child or read to your own child, or sound off about literacy and/or illiteracy. And to think, I was selfishly claiming those 20 minutes each night to get a free cuddle and revisit my favorite books! How delightful that so much more grew out of it. Categories: Charlotte reads, reading, World Read Aloud Day | Permalink.